People pray as Notre Dame cathedral is burning in Paris, April 15, 2019. ​The fire chief in Paris reported crews were struggled to contain the fire, which progressed into the cathedral's wooden interior and one of the architecturally distinctive towers. Streams of water from fire hoses whipped across the exterior. "It's terrible, it's catastrophic. 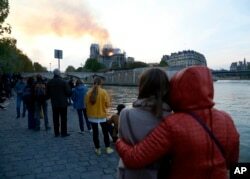 This is the soul of Paris,'' Bouret said. "Now you can smell it burning,'' she said of the monument she'd stood in so recently.